SBR Soletanche Bachy Fundaţii has recently been contracted by KEI Development to work on the FREELO project in Bucharest, Romania. SBR Soletanche Bachy Fundaţii are currently working as the main contractor and designer of the Special Foundation work for the FREELO project, in a contract which is valued at 3.5 million euros. FREELO is the first aerodynamic wind tunnel in Romania and South Eastern Europe, comprised of a 20m high superstructure and an underground structure, at a depth of -19.50m below natural ground level. The depth imposed the necessity for an excavation retaining system adapted to the special structural particularities of the project and to the geotechnical conditions of the site, which comprised in the adoption of a dual cell shaft, locally supported by metallic struts, providing an advantageous solution and an innovative deep excavation project. 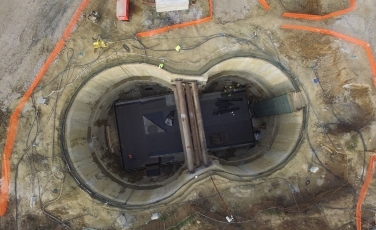 The FREELO project, which has an overall project value of 8 million euros, is unique in the context of Romanian geotechnical engineering, as it is the first local dual cell shaft. Thus, the design and configuration of the retaining system became a difficult engineering challenge because of the depth, which is 50-80% deeper than common deep excavations in Romania and due to the necessity of adopting an alternative solution, which is rarely used or documented. Taking into consideration all the distinct characteristics of the project and soil conditions, usual solutions adopted for retaining systems could not have been considered due to a lack of performance in costs and productivity. Due to the limitations and constraints encountered during the project’s evolution, approaching a particular and atypical project with rigorous study and by consulting technical literature and specialists from the Soletanche Bachy Group represented key components of the design and execution process. As initial input, the geotechnical conditions and the project’s configuration imposed a high level of caution and awareness during the design process. Structural configuration, thick layers of sandy soils, high water tables (second under pressure aquifer) and the depth of the excavation (50-80% deeper than usual projects in Romania) represented aspects that needed to be taken into consideration. The technical solution that was adopted to best serve the aforementioned particularities, consisted of a retaining system composed of a diaphragm wall, disposed as a dual cell shaft. The main functioning principle of circular diaphragm wall is the arching effect, which transfers through the concrete as a hoop stress. Monitoring and instrumentation of the retaining system was carried on in order to validate the utilised calculus assumptions. Thus, by means of inclinometric readings and strain gauges embedded in concrete and mounted on the steel struts, a good image of the excavation’s behaviour was obtained. Taking into account all difficulties encountered, the final solution is an innovative deep excavation project, that offers the possibility to optimise construction times and costs, and is probably one of the most challenging geotechnical engineering projects in Romania so far. The project started in May 2015 and is due to be complete by November 2016.